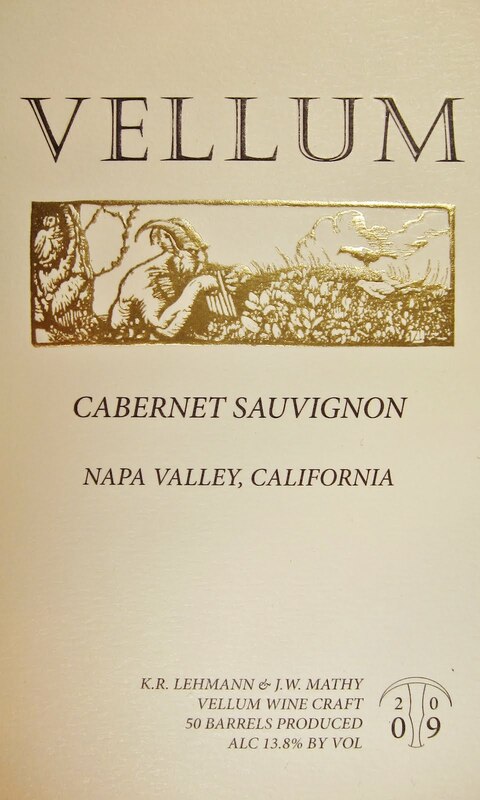 The 2009 VELLUM Cabernet Sauvignon does not need to stand up to get noticed. The wine displays dense, opaque violet tones from the start. The colors are whole, full, and move together. Tell-tale signature aromatics of sweet tarry tobacco, pure vibrant cassis, and summer thicket bound up from the wine. A heady final note of baking spices then continues on to the palate. Here blacker forest fruits emerge and knit with flavors of tar,minerals and winter mulling spices. They ascend as a capacious wave and fall gently onto a long, seamless and structured frame. In a crescendo, they are greeted with a vibrant, wild succulence and pile up in layers of an utterly satisfying and lasting richness. The effect is captivating! 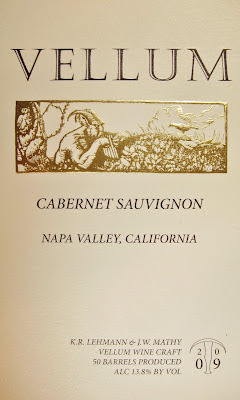 The 2009 VELLUM Cabernet Sauvignon beams confidence and is certainly a wine that exceeds the sum of its parts. It exists with a presence of its own and has come into form with all the markings of classic bearing and proportion that foreshadow a great long life. The 2009 wines are about to be bottled and the 2011s are begging to be noticed! What to do? Hmm… How’s this? Please join us on Saturday April 14th 2012 for a rare sampling of these grand wines ahead of their much anticipated release! Also, be the first to discover why these vintages may very well be gone soon! As seems to be the current trend, I won’t even get any – and I made them! I think I need to re-negotiate my perks? Any way you look at it, this is a great plan! We always enjoy the great French En Primeur tradition of barrel tasting the newest vintage, but we are also offering up the 2009 vintage too. On Saturday, our new 2011 reds, the coveted soon to be released 2011 Vellum White will be sampled for “future” consideration and we will preview the 2009s ahead of bottling. I love it! Vellum Wine Craft is one of the few small producers in Napa Valley to confidently “Put it all out there!” for the world to see the purest form of Vellum, before the wine elevates in its maturity. Always an exciting time! With these vintages side by side we hope everyone can get a better idea of the flow and maturity of Vellum as it ages. I am certain that no one does this but us! Why? Who knows!... However, we want all of you to know, really know wine in all its bits, pieces and stages - not only what you go home with in a bottle. As for the 2011 wines, I will let your imaginations run wild when you taste, but I thought it would be best to share a few “humble” words on the 2009 vintage before it is put to rest in glass. The nose of the 2009 Vellum leaps from the glass with top notes of cassis and exotic spice, a heart of aged briar and creosote and a base note of wild dark blackberry. This deep ruby wine is surprisingly seductive with lots of intense brambly fruit. It covers the palate broadly all at once with muscular layers of fine tarry extract and seamless integrated oak. The finish is wonderfully long and vibrant and it possesses a grand lasting persistence. The nose of Vellum Black has real charm. Subtle spiced cream and warm blueberry compote aromas bound up and give way to well defined oak and an inner perfume of anise. The wine moves as one unit, finding broad traction across and even under the entire palate. There is a very supple fabric here, yielding in the right places and exposing concentrated notes of wild blueberry and sweet tobacco. The finish warmly lingers with terrific length. Vellum Black displays a classic proportion and exudes and overall harmony even in its youth. I hope all of you enjoy these wines this weekend (and beyond?) as much as I enjoy making them…You may use your own adjectives?! We are looking forward to Saturday, and I want to remind everyone to pace yourselves…There are a lot of wines to get through, and we want you to try them all!